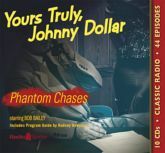 Bob Bailey stars as the dynamic Dollar as he faces fraud, fatalities, and phantom chases. He attends the inscrutable insured, including a doctor who won't see patients, a boxer who shouldn't step inside a ring, and a violinist who wouldn't play�and then couldn't be found. When people die of accidents that were on purpose, or of premeditated natural causes, Johnny brings the justice and the killers get caught. This 10 CD collection features 43 digitally restored and remastered episodes, including such gems as the series only nine part storyline, and an episode of Romance that features Bailey as an impulsive chap named Johnny in a mid-east adventure!